Im guessing Air bags will soon start becoming mandatory in the higher level classes and start filtering down. Happened with the HANS device. Everybody complained about the $700 price for ages, later it became law and it just become another item you had to get. I've been looking at the A-stars option and I like it for a few different reasons..
1. I've ran a ot of A-stars gear over my racing career and like it. My current suit is the A-stars Atem, which has worked really well and held up respectably in a 95-100mph low-side. 2. The A-stars integrated component is a separate piece that zips into compatible suits. This is nice, so if/when you need to send it off for a recharge, you can simply remove it and send it out, leaving you with a functional suit sans airbag system. 3. The A-stars system has 2 charges vs. only 1 on the Dainese. So if you have a small get off early in the day, you can still continue and have the airbag for a 2nd go-round. The flexibility and options has me leaning toward another A-stars as my next suit. end up being hugely oversize with all the gear removed? Just curious, as it sounds like a more favourable option to me. Eh, I think that might be a bit of a harsh estimation of the A-stars option. I mean, it's still an integrated piece that only works in compatible suits, so it's more or less made to fit into a custom/specifically designed suit. Also, it so closely mimic'd the Dainese airbag system, that Dainese sued for patent infringement in Germany and won. A-stars is no longer able to sell the airbag system in Germany. Must be a decent system if it's basically the same tech as the D-air. The D-air system is likely a better product overall, sure, but the cost is a lot to swallow all at once. Being able to stage the purchases as an optional component is an attractive option for potential consumers as well. Wondering this myself and has me hesitant to pull the trigger. I believe the tech air vest has a built in back brace and if you were to use a standalone brace like we already do now, it would be a similar/close fit. Would like to try it all on with vest off/on and see what it's like, but don't know anyone nearby that has one I can try. From all the media I’ve read/watched about fit is you don’t go up a size to fit the vest. Apparently it’s similar to putting a chest protector in...not really noticeable once it’s zipped up. I also like the A* option because of the staged purchase makes it an easier pill to swallow and even though it’s not really the point, it even looks better as integrated vs external. I didn’t know about the lawsuit and that is a pretty big point back in favor of the A* system. I can also get behind the point of it’s only available for very specific suits so that makes the argument about fit/function more even keeled as well. Jarel brings up great points which is exactly what I was hoping to do-start a healthy discussion about the suits/technology. I’m starting to get lost as to what I should do but it’s a double edged sword because I love quality conversation on topics such as these! Help! Cost wise a suit with external seems the best, safety wise an integrated suit is best. Is it best to purchase overseas to get a higher quality suit for the lower overall cost? I'm not saying the A* system is "bad", just that it's not as good as D-Air. How much of a gap there is is up for debate, and A* will certainly win the marketing war since they're marketing Ninjas and Dainese are marketing pre-schoolers. The actual bag is not the same tech as D-Air, it's an offshoot of their failed prior Tech-Air product that was so bad they pulled it. Imagine having a big balloon wrapped around you, when you land on one side the air is pushed over to the other side and you get very little actual impact protection. That's how it worked. They knew that wasn't going to fly for long, so they tried to copy the D-Air fiber-reinforced bag technology, and got sued. Now they've changed it by sewing channels into the bag to keep it from overinflating, creating air channels instead. It's still not anywhere near as elegant as the D-Air bags. The D-Air bags inflate across the entire surface area of the bag, but only inflate to a specified thickness due to the internal fiber reinforcement. This is the big deal, and the main patent and it was a brilliant design. Jarel, thank you very much for that more detailed explanation. That makes a lot of sense. 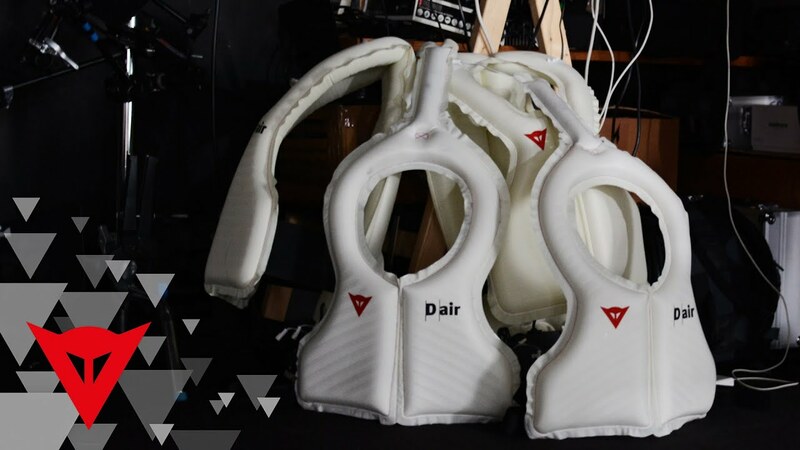 Do you still need a separate back protector with D-Air and A* bag systems? Yes, the D-Air suits come with the specific Dainese back protector that the suit is designed to work with. You can optionally wear a supplemental chest protector as well (I do).